John Dropcho has been an artist and educator for over 40 years. He has an extensive exhibition record with numerous awards from juried shows. He has shown in hundreds of group, juried and invited exhibitions, at galleries and museums such as: NOHO Gallery (New York); Gallery in the Square (Pittsburgh) William Penn Museum (Harrisburg); Southern Alleghenies Museum (Loretto, PA); and The Carnegie Museum (Pittsburgh). His work can be found in many private collections and corporate collections from: McDonald's Corporation; U.S. National Bank; Copperweld Corporation; Ward Foundation Collection; Roadway Corporate Collection and others. John is a graduate of Indiana University of Pennsylvania (B.S. in Art) with a M. Ed degree from Pennsylvania State University and PostGraduate work at The University of Pittsburgh and Carnegie Mellon University. 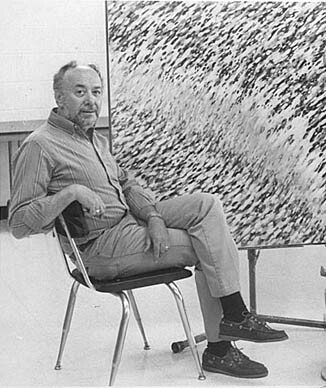 As an art educator, John Dropcho taught at Indiana University from 1966-1991 and is now Professor Emeritus. Prior to that he taught for the Crafton Pennsylvania School District. "John Dropcho has been an inspiration to me in his work as a teacher, and also as an artist. He was my first serious art teacher, at Crafton High School- and he immediately made me feel, that being an artist was important: it was worth spending your life, doing art! He didn't "say" it- it was transmitted by his own enthusiasm and dedication, to both art and teaching. As an artist, he has often influenced me, without my being aware of it. He once showed me some paintings with "borders" around them in the early 1980s, and, gee- a month or so later, I got a GREAT IDEA- put a BORDER around my paintings! A few years later, I realized where the idea came from! I have enjoyed the fact that his work has reacted to time and experience. He has "wrestled with art" - been an explorer and adventurer in his art. There is also a unity to his vision, however. It reflects and honors nature: usually in an abstracted, and always, intense, manner. Water flowing, clouds, effects of light- these are the origins of his work. John is also a great man, in the truest sense of the word. His integrity, honesty, openness, willingness to share his ideas, dedication- his sense of humor- his love of life: I am very grateful to have met him.